Rustic 3 bedroom, 2 bathroom cabin on the lake, sleeps 7. One bedroom with double bed and bathroom. (Shower stall, no tub) One bedroom with double bed. One "kids room" with one bunk bed set and one single bed. Small bathroom with small shower stall, no tub, in hall. Full kitchen and dining area. Good sized living room. This property has its own boat ramp and open air boathouse. Two story dock. Charcoal grill under shelter. 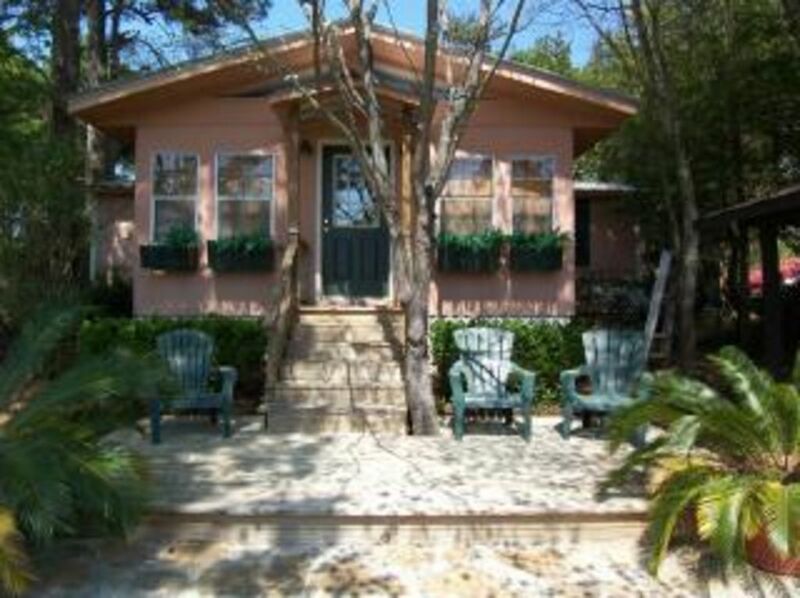 Air conditioning, cable tv, vcr/dvd, full kitchen with dishwasher and microwave, charcoal grill, bed linens are provided. YOU MUST PROVIDE YOUR OWN TOWELS. No pets & no parties please. Sweet little cottage with beautiful 2 story dock. Owner very responsive to any needs. Most relaxing vacation in a long time! We enjoyed the cozy little cabin! The property is quiet and the cabin and dock are great. I wish we had more time to stay! Great place to get away and relax! We really enjoyed this place. It was a perfect get away for the family get together we were looking for. The lake was beautiful and fishing was fun. We will be back soon. Great getaway spot for a girl's weekend! My group of friends have known each other for more than 25 years. Each year we escape to Lake Blackshear for a girls weekend and were so excited when we got to this adorable little cabin. There was plenty of room for everyone, and the dock was so comfy and cute - perfect for evening cocktails while watching the sunset. We hope to be back there again with each other, or even for a weekend with our families. We love the Pink house! We had a relaxing week at the lake. The house is a prefect retreat after a day on the lake! Fishing, swimming, boating, waterskiing, and jet skiing. Hunting at local plantations. Golf at 3 locations including Georgia Veterans State Park. Albany, GA is 30 minutes away with shopping, Flint Riveraquarium, Chehaw Wild Animal Park, Convention Center, dining & theatres. Andersonvill National Historic Site And Jimmy Carter Museum in Plains, GA a short distance away.